We left a cold, inhospitable Norway, and were moved to an island in bloom in only five hours. It is difficult to describe the feeling when landing on a beautiful green island outside Africa, seeing palm trees, cacti, and other exotic plants along your way. Here are a few botanical highlights from this beautiful spot outside the North African coast. The Canary Islands is a Spanish province, and on these islands you have a pleasant climate all year around. We visited Gran Canaria where you find the largest airport and the largest city of the province. 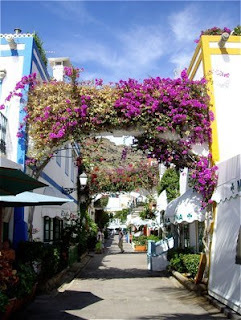 The North of Gran Canaria has a subtropical climate. Here you have more humidity, as there are far more rainy days than the southern part that enjoys a North African climate with a very dry and hot climate. This is the part of Gran Canaria we stayed in. Due to artificial irregation, there are beautiful gardens and park even here, in the dry desert like landscape. Here are a few of the flowers we saw on our way. Look at this breathtaking yellow flower! We found it during a morning strole from our hotel on February 9th. A firework of shades of yellow and dark red! 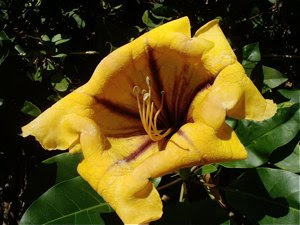 It is called the Golden Chalice Vine, Cup of Gold or Hawaiian Lily, and is endemic to Mexico and Central America. This huge flower is an impressive sight, and when touching it, it felt like leather, as it folded up. It appeared in a shrubbery climbing on a fence, and the different kinds of plants protected the bungalows located on the other side. An old acquaintance - Possibly a Bauhinia purpurea? I had seen this beautiful purple flower before, another place in Africa. October 4th 2007 I walked down a street in Pietermaritzburg in South Africa, and spotted the same tree in bloom. 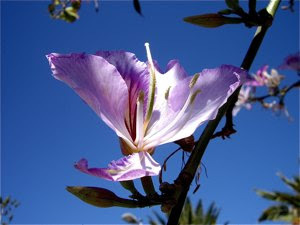 I am a little in doubt whether it is a Bauhinia purpurea, a flowering tree nativ to South Eastern Asia. 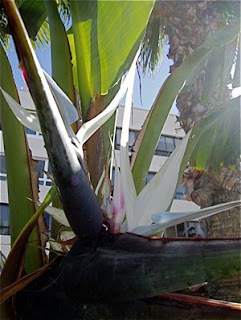 It is still a breathtaking flower with shades in white and purple, and it is amazing to see such a tree in bloom. Puerto de Mogán is a beautiful spot I will return to later. When wandering through the beautiful narrow passages in this town you find an abundance of flowers and plants climbing on the facades of the houses. As this blue beauty, found in a shady street. You just wish you were there - again!! My friend Dagfinn told me that this was a Thunbergia Grandiflora. Read the story here. 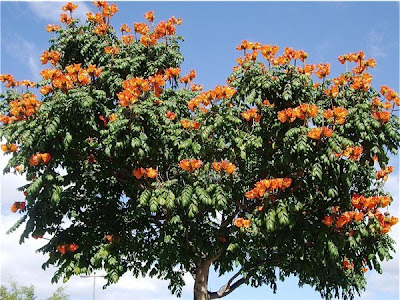 These magnificent flowers were found on a Spathodea campanulata, a tree native to tropical Africa, planted along the streets of Playa Del Ingles. They were huge and were found in large numbers on each tree. There were many buds on each branch, and as soon as one had died another opened up, revealing its bright red and yellow colours. Strelitzia, or bird of paradise, is a beautiful orange and blue flower. It belongs in fact to the Banana family, and here you have one of its relatives. This pale and white blue flower grow on a tall plant that originates from South Africa, with a bundle of large intensely green leaves. You can easily see that it related to a banana plant. This is also a plant I have seen before in the enclosed garden of the Sundown Ranch Hotel, close to the Pilanesberg National Park north west of Johannesburg. No, this is definitely not a Daisy. It is the leaves, not the flower that gives it away. 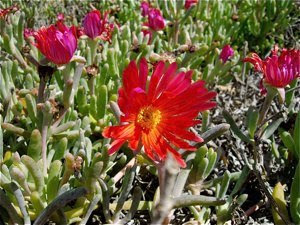 We found this brightly red flower in a low bed at Faro, on the southern most tip of the Canary Island. 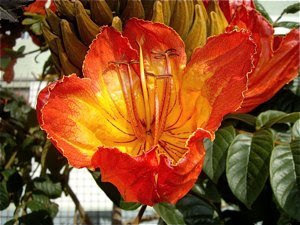 It adorns a hardy plant with thick water filled leaves, that may survive long droughts. Most of us that have one or two cacti in our window, will never see it flower. When flowering, most cacti have beautiful flower. 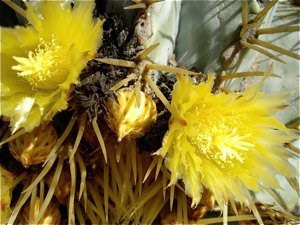 We found these beautiful yellow flowers on a cactus planted at Faro. 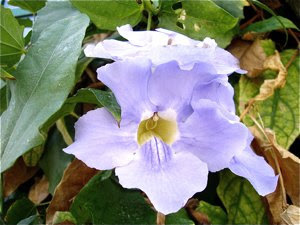 The Blue Beaty of Mogan is a "Thunbergia grandiflora"!